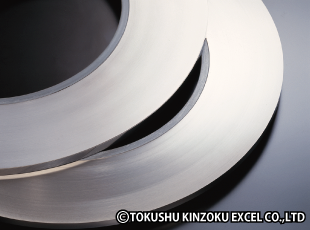 Carbon Steels (S15C, S45C, S50C, S55C, & S60C) | TOKUSHU KINZOKU EXCEL CO.,LTD. Watch parts, automotive parts, washers, office appliances, electrical and mechanical components, springs, washers, clutch parts, Thomson blades, and bearing parts. Carbon steels have lower carbon content than carbon tool steels, and have less-strict regulations on impurities. They are used in applications that require a certain amount of strength and toughness. Carbon steels with low carbon content offer better raw-material workability, but are susceptible to uneven quenching, so care must be taken with regard to temperature management, cooling methods, and the like. Of the special steels, carbon steels have lower hardness, and possess toughness, so they are used in structural components where a certain degree of strength is required. Our ability to produce thickness tolerances that are impossible to achieve using regular materials allows us to manufacture products that provide stable strength and part dimensions. Moreover, we can reduce variation between lots and ensure a high degree of reliability through careful management of manufacturing processes. 1. While a rolled finish is sometimes used for slightly bent products, we normally use an annealed or skin-passed finish for such products. When treating cold rolled special steel strips, the higher the carbon content, the easier decarburization occurs. In particular, the risk becomes greater in in high-temperature heating processes like quenching. If the material is contaminated with dirt or foreign substances then high temperature corrosion may occur. Therefore it is necessary to pre-treat material surfaces by cleaning them and adjust the atmosphere of the furnace before heat treatment. RX gas is used as a standard furnace atmosphere during quenching, NX gas during tempering, but N2, H2, AX gases, and others are also used. In some cases, neutral salt-bath furnaces, metal bath furnaces, furnace tubes, cases, and other equipment is used to ensure that the material does not come into direct contact with the air. In spite of their hardness, quenched materials lack toughness and are brittle. To be finished into materials that possess toughness and strength, they must therefore must be tempered. Tempering conditions are determined depending on the required properties of each material by considering test results, the steel grade's quenching and tempering properties, and other factors. For cold-rolled special steel strips, long tempering time is used for certain cases (particularly when toughness is required) because the amount of material used is small and tempering work is often carried out consecutively. However, it would seem that most manufacturers often use a short tempering time of no longer than a few minutes. Moreover, due to the nature of the consecutive tempering process, if time is short then the temperature is set a little higher and products are tempered repeatedly. However, as a general rule, materials that are tempered at low temperature for a long time have more toughness than those that are tempered at high temperature. Care is therefore taken to avoid making the tempering furnace shorter, the tempering temperature higher, and the tempering time shorter than necessary. Using an oil, metal, or salt bath for tempering makes it possible to reduce time compared to open-air tempering. Materials are annealed to soften them or remove deformation. In such applications, the appropriate annealing temperature is 600ºC–700ºC. If the temperature is too high, the structure can be changed and decarburization or scaling may occur, so it is generally preferable to select a temperature on the low side. 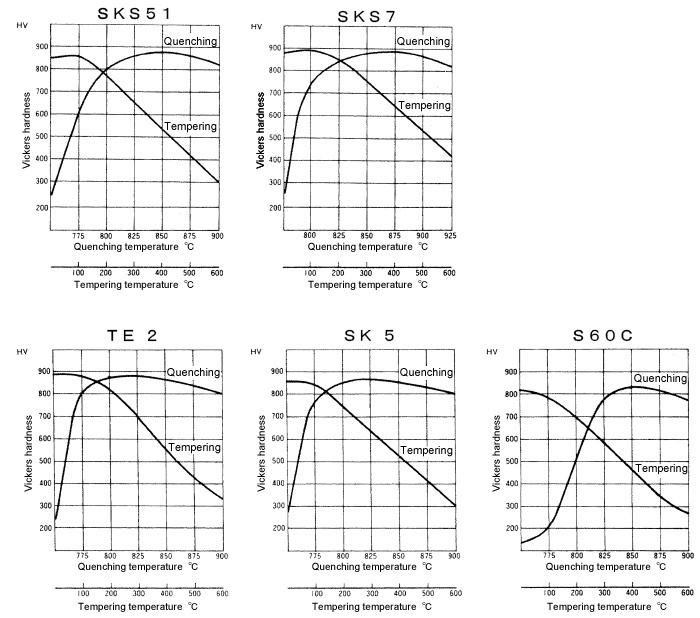 Charts profiling special steels, carbon steels, and carbon tool steels. They can be used as a reference for comparing carbon content and strength. Introducing carbon tool steels (SK grades), which have more carbon content than carbon steels (S**C grades).